Evan (Freddie Highmore) is an orphan who is about twelve and lives in a group home believing that if he ‘follows the music’ he will find his parents. He runs away and ends up in New York city with no money, but falls on his feet to some extent after finding Arthur (Leon Thomas III), a kid who busks and lives with a bunch of kids in a condemned theatre with their benefactor, Wizard (Robin Williams). After a series of events, he ends up studying at Julliard and writes a symphony that the New York Philharmonic end up playing in a concert in Central Park. His mother Lyla (Keri Russell) has been told by her evil father that the baby didn’t survive when he had, in fact, put him up for adoption, and I don’t think Evan’s father Louis (Jonathan Rhys Meyers) even know he existed. Would the music bring them all together? Who cares? This is an absolute stinker. It seems like the story could potentially have legs, but the main character is such an insipid and annoying character that I don’t care, the structure of flashbacks mixed in with present moments is sloppy and I had no connection to any of the characters at all. It felt as though when the script was being developed, someone kept pointing out potential holes in the plot and then some crappy thing was written in to plug it. And I couldn’t see the point of Robin Williams’ character. It was like he was supposed to be an evil, horrible man and instead he was just a bit shouty sometimes. Whatever. 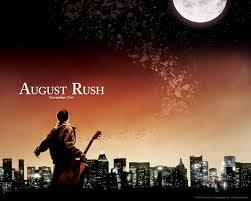 August Rush was nominated for an Oscar for Best Achievement in Music Written for Motion Pictures, Original Song (Raise it Up).